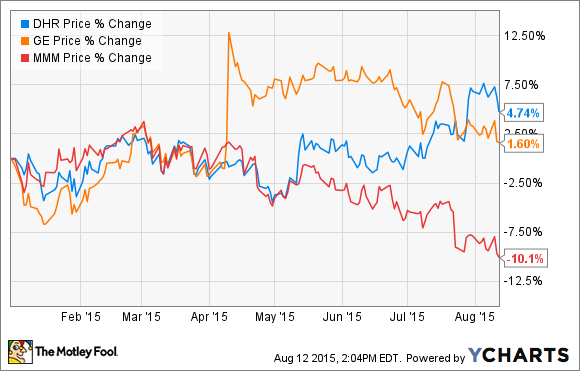 Can the company continue to outperform the S&P 500 in 2015? It's been a difficult reporting season for the industrial sector, but Danaher Corporation (NYSE:DHR) stands out from its peer group in terms of results and prospects. A mix of favorable end-market exposure, corporate restructuring activity (management intends to split the company into two separate parts), and excitement over its intended $13.8 billion purchase of Pall Corp. has led to the stock's outperformance versus the market and its peer group in 2015. With that said, let's take a look at the five things management wants you to know about Danaher's current trading and future prospects. The key to understanding Danaher's business model is to recognize how its management focuses on making acquisitions in order to generate growth by applying its Danaher Business System, or DBS. You can read about DBS in more detail here, but suffice it to say that the key metrics to assess Danaher's performance are its core revenue growth and core margin growth. They are useful because they strip out any effects from acquisitions, particularly with reported revenue and margin. Danaher recorded 3.5% core revenue growth in the second quarter, and with his guidance for the third quarter, CEO Tom Joyce "assumes core growth comparable to the second quarter of 2015." The guidance is in line with management's full-year expectations and a pretty good result in an environment where many other industrial companies have been cutting guidance. Danaher's core revenue growth, however, is stronger than the numbers above suggest. The reason? Danaher's revenue growth has been held back by poorly performing communications sales (within the test and measurement segment). For example, core communications platform sales declined double digits in the first quarter and then at a low-single-digit rate in the second quarter. Indeed, in a question on the earnings call, Sanford Bernstein analyst Steve Winoker suggested "core growth ex-comms for this past quarter would have been closer to 4% than 3.5%." Joyce promptly agreed with him on this. It's an important point, because Danaher recently merged its communications business with a subsidiary of NetScout Systems, suggesting that Danaher's core revenue growth could improve in future quarters now that the troublesome communications business is out of its hands. 3. Pall Corp.: The new Beckman Coulter? When discussing the potential for the Pall Corp. acquisition, Joyce argued, "We see a number of commonalities between Beckman and Pall, and believe we'll be able to run a similar playbook at Pall in the coming years." Frankly, investors would be very pleased if the Pall Corp. acquisition turns out in the same way that the Beckman Coulter deal did. For example, since the acquisition in 2011, Danaher has increased Beckman Coulter's operating margin from around 10% to more than 15% today. Alongside its communications business, Danaher has been seeing weak growth in its dental segment. For example, core revenue in the segment was down slightly in the first quarter and only up 1% in the second. However, Joyce gave some positive commentary on the earnings call: "We think we're approaching the tail end of some inventory related destocking activities that impacted primarily the equipment side." Moreover, he declared himself enthusiastic "about the great start that we've had with Nobel." Danaher bought Nobel Biocare, a leading dental implant manufacturer, for $2.2 billion in late 2014. On the earnings call, CFO Daniel Comas outlined that the company's acquisition activity would remain in place despite the intended separation and the integration of Pall Corp. Comas said, "We're not going to do any multibillion-dollar deals here in the next 12 months, but I think you should see a very healthy continued pace of bolt-ons across the platform." In other words, expect its acquisitive business model to continue despite significant structural changes in the next year or so. All told, Danaher is well set for the rest of 2015. Its core revenue growth remains good, and management has taken action with the poorly performing communications business, while the dental segment looks set for a better second half. The plan to split Danaher into two separate companies remains on track. The Pall Corp. acquisition offers good opportunities for Danaher to apply its widely respected DBS, and generate earnings growth for investors in line with its traditional business model -- and management remains focused on acquisitions despite the Nobel Biocare and Pall Corp. deals. In short, Danaher's management is executing and the market continues to reward investors for it.